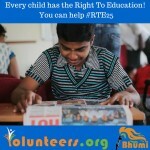 Every year Bhumi volunteers create awareness about the Right to Education act to thousands of families. This year together we will help admit 6,000 children across Tamil Nadu. The Right to Education Act 2009 mandates that all private unaided schools have to reserve 25% seats for the children from disadvantaged or economically weaker sections. Their complete education is free and the admission happens only at class LKG. 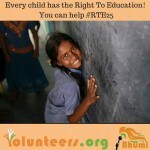 Unfortunately the people who can benefit from this are unaware of the RTE Act or the procedure. We are organizing city-wise RTE volunteer meetings to spread awareness among common public. We believe that this is a life transforming opportunity for every child. 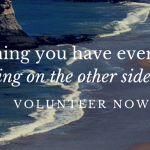 Our focus is to engage volunteers in creating awareness among such communities and helping them benefit from this. Join us to spread awareness across Tamil Nadu and make a lasting poverty alleviating impact on their lives. Invite your friends, All are welcome ! In a move that is likely to have an adverse impact on admission of children belonging to weaker sections and disadvantaged groups in private schools, the Department of Primary and Secondary Education plans to change the criteria for admissions under the Right to Education (RTE) Act for the 2018-19 academic year. Shalini Rajneesh, Principal Secretary of the department, has proposed that students applying for RTE quota seats should first be admitted to government or aided schools in the neighbourhood. If there is no government or aided school in the vicinity, only then should they be allotted seats in private schools. In her proposal made on January 6, she said the move would help the State government save crores of rupees, and address the problem of dwindling student strength in government schools. According to the prevailing practice, ‘neighbourhood’ is a revenue village in rural area, a ward in city corporation limits, and the entire jurisdiction in cases of urban local bodies. Department sources said the idea was mooted along the lines of the Kerala model. However, many officials said this would be a severe blow to RTE quota in Karnataka. “Every ward in Bengaluru has a government and an aided school. If this rule comes into force, the chances of a child getting admission under RTE quota in a private school is ruled out,” an official said. The sources said these changes could be implemented only after the State Cabinet approves them. When contacted, Primary and Secondary Education Minister Tanveer Sait said he was yet to look into the proposal. “Ensuring that students get admission under the RTE quota in private schools is the commitment of the government. We will ensure that the interests of parents and students are protected,” he said. The proposal by the Department of Primary and Secondary Education to tweak the RTE admission criteria has been criticised by parents, parents’ associations as well as private school managements who feel that the move would “dilute” the provisions of the Right to Education (RTE) Act. They said the government should not make changes without consulting all stakeholders. Parents who want their children to study in schools where the medium of instruction is English have raised concerns that this may not be possible if the proposal is implemented. Noting that the existing system benefited lakhs of students, B.N. Yogananda, general secretary of the RTE Students and Parents Association, said groups would work towards ensuring that it continues. “If the new proposal of the department is implemented, the concept of social justice and social inclusion will have no meaning in the education sector,” he said. Some experts, however, are in favour of the move and feel that it would give a boost to government schools. V.P. Niranjan Aradhya, fellow at the Centre for Child and the Law, National Law School of India University, said it would fulfil the primary obligation of the Right of Children to Free and Compulsory Education Act. The aim of the Act is to ensure that the onus of educating children between the ages of 6 to 14 falls on the State government. “People, however, are concerned about the quality of education in government schools and there is a need for the State government to address the issue by fulfilling the norms and standards specified in the Act,” he said. Karnataka | Second thoughts on RTE quota? Having spent over Rs. 160 crore towards fee payment of students admitted in private schools under the Right to Education (RTE) Act in 2014-15, the Education Department is contemplating whether to continue with the RTE quota, Minister of State for Primary and Secondary Education Kimmane Ratnakar has said. Replying to a question by Dayanand, Congress MLC, in the Legislative Council, the Minister said the Centre was also thinking on the same lines and a final decision would be taken by January. The amount could be spent to improve government schools, he argued. “We have so far spent Rs. 365 crore towards fee payment to private schools. So far, 3.16 lakh children have been admitted to private schools and the government is paying for them. If we spend the amount on providing infrastructure in our schools, they can be on a par with private schools,” Mr. Ratnakar said. He assured that the department would soon deposit the pending fee amount to private schools for students admitted in 2015-16 and that the future of students would not be affected. Mumbai: The state government has disbursed the first instalment of Rs 22 lakh meant to be disbursed to unaided, non-minority schools in Mumbai region for admitting students to the 25% seats reserved under the Right to Education Act, 2009. These funds have been handed over to the civic education department for further disbursal to the schools for admissions of the previous academic year (2014-15). An official from the civic education department said that they had demanded over Rs 45 lakh, but the office of the deputy director of education has received half of that as the first instalment. New Delhi: The Supreme Court on Friday said monitoring the implementation of the Right to Education Act across the country is a herculean task and it’s not possible for it to undertake such an exercise. A social justice bench of Justices Madan B Lokur and U U Lalit refused to entertain a plea seeking direction to the Centre and state governments to appoint sufficient number of teachers and build schools as per the Act saying “it would be impossible for us to monitor”. The petition filed by NGO, National Coalition for Education, alleged that the governments were not taking steps for implementation of RTE Act in true spirit and sought the court’s intervention. Senior advocate Colin Gonsalves, appearing for the petitioner, submitted that there were not sufficient number of schools and teachers to provide primary education to all children. He said that around 1.5 lakh schools and 12 lakh teachers are needed to implement the Act. The bench, however, said it could not ensure implementation and it would be proper that high court of respective states look into the issue. The bench asked the petitioner to approach each HC to ensure proper implementation of the Act in the respective states. The Constitution (eighty-sixth amendment) Act, 2002 inserted Article 21-A to provide free and compulsory education to all children in the age group of six to fourteen years as a fundamental right. The Right of Children to Free and Compulsory Education (RTE) Act, 2009, says that every child has a right to full time elementary education. New Delhi: The Law Commission of India has recommended amending the Right to Education Act to make it mandatory for the government to provide free pre-school education for children above the age of three. In its latest report submitted to law minister Sadananda Gowda, the Commission headed by Justice AP Shah recommended amending the RTE Act to “prepare children above the age of three years for elementary education” until they complete six years of age. As per the 2011 Census, India has 158.7 million children in the age group of 0-6 years, comprising about 16% of the total Indian population. Social activist and advocate Ashok Agarwal told HT that if accepted, the law panel recommendation would bring transparency in the nursery admission process. “Immediate impact will be that the screening process of kids or parents will be done away with as schools will have to conform with the RTE Act. This will ensure that there is no discrimination during admission in nursery level,” Agarwal said. The Commission also recommended amending the Constitution to ensure that the right of children below six to basic care and assistance be made an enforceable right by the insertion of a new Article, 24A, to Part III of the Constitution. The Commission also recommended amendments to the Maternity Benefit Act so that maternity benefits are increased from twelve weeks to 180 days and cover women working in the unorganized sector too. Policy and lawmaking is about state, about sustainability, about social engineering and certainly about stakeholder negotiations. In India, it is also about—see what happens. This is not a bad thing in itself. A process that listens and adapts according to representations made by the people cannot be wrong, but to adjust and patch through changes on the go is quite an adventure. Often the see-what-happens school of policymaking sees it evolve live after it has been enacted. Dependence upon this school is an adequate explanation for the half-baked nature of many decisions. This includes a range, from the bus rapid transit (BRT) traffic corridors to the Right to Education (RTE) Act when it was first announced. The RTE law is a beauteous example of a law that evolved after its promulgation and continues to do so even today. The law has, predictably, not done well on contact with reality and its first reform is quite overdue. Much is due to a system that is trained in post-facto design and iteration, aka adjust. Witness the annual budgeting exercise for the nation. Admittedly it had much more significance in the licence raj, but even today the industry lobbies thrum with activity in January and February as they pitch for lower taxes or other concessions in the budgets. It is when the budget is revealed to the supplicants and Parliament that the real adjustments and negotiations start. The rates and concessions change according to the ability of the lobbies to persuade the finance ministry of the merits of their argument. Each year we see this, each year the system trains itself in post-facto policy design. If we watch carefully, the design aspect is precisely what is abandoned at the altar of negotiation. Take the education law as an example. The Act blithely carved out a quarter of the capacity of private aided non-minority schools and arrogated it to the state with no mention at that stage of either funding or process. By all accounts, the discussions that preceded the drafting of the law were fiery and extended—hopefully to craft a well-tested document that would abide. Then how did it forget to provide for its own processes? How did it forget to identify its own resources, even at a strategic level? How did it forget to notice that the Act, which was meant to universalize education, would not even apply to minority schools? Why were these gaps left in the Act? Was it designed to fail? It certainly funded itself so. The gaps could have been reduced with effective consultations and process. Surely there must have been a process of consultation while the law was being drafted, even if nominal. The fault is not only on one side; often open consultations have not received adequate responses with protests and pushback coming in only after the policy has been announced. Rarely have consultations been taken seriously till the draft is actionable. It is as if the stakeholders do not believe in the government’s intent till the force of law is behind it. As with the budgets, the actual negotiation and consultation for the RTE Act took place after the law was passed. Schools that were in danger of being shut down were able to negotiate with the state rule-makers to adjust regulations according to local needs. Indeed, only when it was fully implemented three years later, did the action really begin. Schools often did not even know how much they would be reimbursed in lieu of a quarter of their revenues lost as the centre and the states had not decided between them who would pay and how much. Much negotiation later, states began to announce the amounts that would be paid, and it took even longer for payment mechanisms to be identified. This could very well have been done before the law was passed, but of course the conversation at that stage was about expertise and access to committee, not about the schools and students it impacted. The gaps in the Act were all too obvious, but the real discussions on these started only after the Act became ‘real’. The consequences of such interactive and iterative policy design are severe. They end up with decisions that are patchy, often ridiculous, and contradictory. 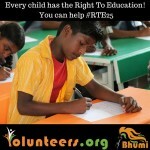 Witness both the BRT fiasco and the RTE Act. Policies must ring true both for the general case and individual needs—and unless the policy has been through deep-dive exercises in scenario testing, pilot schemes and stakeholder consultation, it is clearly not ready to be unleashed upon people. Lawmaking and policymaking must have a process that allows them to align. See-what-happens-then-adjust post-facto patchwork can only cause chaos along the way. One goes aback to the RTE Act as an illustration. Years into its ostensible implementation, now they (Karnataka leads) figure out that private school fees do not include books, uniforms, stationery and project incidentals. The schools have been ordered to pay, pushing up their costs. Often the state government compensation does not even match their cost per student and this is cross-subsidised by a raise in fees for other students. This cost-dump comes at a time when private schools and parents are already in a tussle over fee rises. Indian parents pay a significant portion of their incomes towards education, to burden them further and cross-subsidize another child is to put unconscionable pressure on them. They pay their taxes, they say—why should the thoughtlessness of the RTE makers force them to pay more fees to their school? The RTE is not a bad Act; it has many merits. Yet, it stands testament to a wider malaise, a heavy reliance on post-enactment adjustment, which can neither be fair nor successful. Such callousness towards planning and design marks decisions out for mockery at best and failure at worst. The Right to Education Act makes it fundamental right of every child between the age of 6 and 14 years to obtain education in any government or private school. The Act makes it mandatory for schools to reserve 25 per cent of their seats for students belonging to the economically weaker sections (EWS) of the society. A research paper by the Organization for Economic Co-operation and Development (OECD), published in the Journal of Comparative Economics, aims to establish that there is no relation between the inclusion of right to education in the Constitution of a country and higher learning outcomes. Citing a study conducted through standardized tests known as PISA (Program for International Student Assessment) in around 65 countries involving 15-year-old students, OECD measured their applied skills and knowledge in math, science and reading. The results from 61 nations suggested that those with stronger constitutional provisions on education have lower scores when projected against those countries with fewer provisions. The research also states that United States doesn’t include any “positive” social rights like right to education, as an example to perhaps prove their point/validate their research. Even without making it a fundamental right, when it comes to quality education, United States is one of the leading nations, with many of its universities figuring in the top list in diverse domains like engineering, business administration, scientific research, medicine, law etc. The education infrastructure is the best, with abundant scholarships, grants and internships to enable students to enroll themselves without much hassle. Despite having education as a fundamental right, basic education infrastructure in India is in bad shape. Lack of qualified teachers, funds, poor learning outcomes are some of the grave issues of concern. Education was made the fundamental right by the Government and the responsibility to educate India was passed on to the private schools, many of which are low budget schools which can’t afford the 25 per cent reserved seats for EWS. The Government promised to reimburse the private schools but it turned out to be another fake promise. This is the surface of the mess Sonia’s RTE has created. Horrible tales of failure of Sonia Gandhi’s flawed RTE Act across the country are a matter of daily news now, said a detailed report on the failures in formation and implementation of the Act. When enshrining educational rights in Constitution adversely affected learning outcomes in 61 countries, there seems to be limited possibility of RTE working in India. Already, signs of its imminent epic failures are vivid. Mumbai: The Bombay High Court today asked Maharashtra government to devise a mechanism to hear grievances of students who do not get admission in private schools under Right to Education (RTE) Act. The division bench headed by Justice Anoop Mohta was hearing a bunch of petitions challenging the government’s decision to exclude pre-primary classes from the purview of the Act. The bench asked the government to file a reply to the petitions within a week. The petitions challenge a government resolution (GR) of April 30 which says that provisions of RTE Act will apply from class I to class VIII but not to the pre-primary classes. The GR cancelled admissions granted under RTE quota in nursery, junior KG and senior KG classes of private schools. The petitions claim that admissions of more than 30,000 students from under-privileged sections of society were cancelled as a result. One of the PILs says that children admitted to junior KG last year under RTE quota will have to discontinue education for one year. Moreover, the admissions were cancelled without giving parents the chance to find an alternative, it says.